Pilates has been taught at Viney Hall Physiotherapy since 2002. Pilates is a mind-body conditioning exercise programme which targets the deep postural muscles of the abdomen and spine to improve overall central core stability and posture which is essential for maintaining good control and balance of the whole body. Many clients choose to attend for Pilates instruction on a one-to-one basis. The reformer is a wonderful piece of equipment designed to facilitate as well as to add challenge to Pilates exercises. Pilates consists of a set of principles, corrective exercises and specialized equipment which combine to work the whole body and to coordinate both the upper and lower musculature with the body’s centre. Pilates, when performed correctly, positively changes the body combining awareness of the deep postural and stability muscles with suppleness and flexibility. The medical world is now realising the benefits of the Pilates method for the prevention and rehabilitation of back injuries. In order to prevent a recurrence of back pain, it is essential to retrain the deep abdominal and spinal muscles. 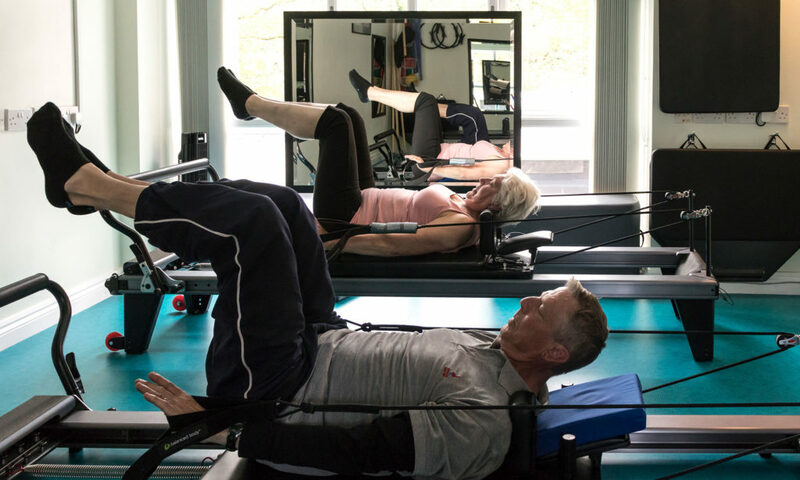 Pilates provides patients with a unique method of exercise that focuses on correct movement quality, core stabilisation and postural correction. The primary aim of Pilates is to build an efficient central core of stability muscles that stabilises the trunk and spine. This is achieved through both mental and physical training. The mind is trained to become more aware of body position, while the deep postural and stability muscles are activated. Mind and body are brought together through the following principles: concentration, centring, breathing, isolation, routine, precision, control and flowing movement. Pilates suits all ages and fitness levels and is particularly beneficial for those with postural problems, back or neck pain, recurrent injuries, arthritis, stress, and before and after childbirth. We have also had several people with Parkinson’s Disease who have found great benefit from attending Pilates classes. Your Pilates instructor will assess your suitability and modify exercises according to your needs. Pilates has been taught at Viney Hall Physiotherapy since 2002. Many people attending physiotherapy with recurrent problems of neck or back pain, shoulder or knee pain, headaches, instabilities, clicky joints, general stiffness or postural aches and pains are finding it beneficial to do Pilates exercises. Many of us develop poor postural habits over the years and these can be corrected by the increased body awareness, flexibility and core strength obtained through regular exercises. Some people prefer to come for individual sessions whereby the therapist works on various joint stiffnesses with manual therapy and supervises an exercise programme tailored to the individual’s needs. Others enjoy the social element of group exercise. An individual assessment is required before joining a beginners class so that the therapist can highlight particular weaknesses or tight muscle groups that need attention. The basic contraction of deep abdominal muscles is taught in this session. The classes consist of a maximum of twelve people and are held in our purpose-built studio with under-floor heating. Many of the exercises are performed on mats and the difficulty is progressed. Respect is always given to different levels of ability and a non-competitive atmosphere is encouraged. Different starting positions are incorporated to challenge stability in sitting, standing and kneeling, exercises becoming more dynamic in the more advanced classes. Resistance bands are used to further strengthen and gym balls, rollers and other small equipment add further challenge and an element of fun. Groups are mixed, men and women of all ages. Specialist classes are arranged from time to time such as antenatal, post-natal and groups for various sports or occupations.